Your black-lacquered and perfectly peaked stiletto-point nails match your bedspread, the macabre-style frames bedecking your bedroom wall, as well as your new (and favorite) lipstick shade, Obsidian Stone. If you're naturally attracted to the raven-colored shade, then incorporating it into your home decor, beauty routine, and personal style is essential. If you've already slathered your walls with a paint shade called "Enchanting Ebony" but you're hesitant to dye your hair black permanently (we don't blame ya) then this wig is the perfect solution. 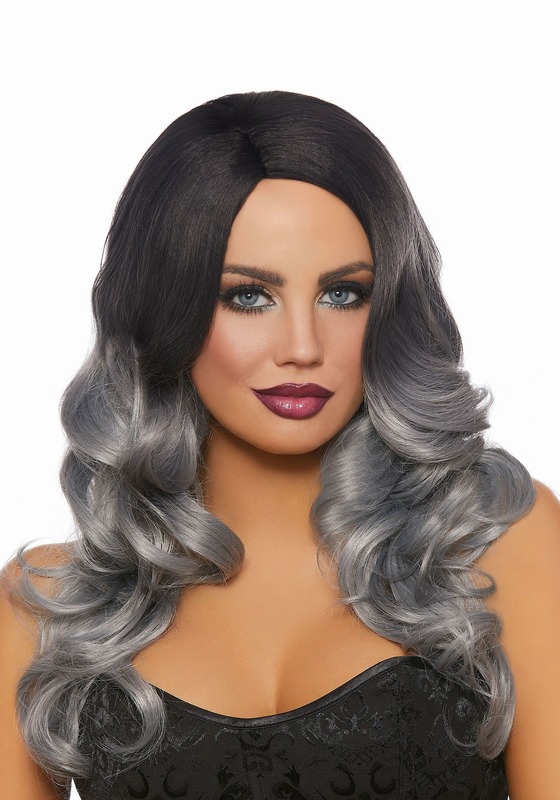 Flawlessly recreating the hairstyle of a modern-day witch, this black/grey ombre wig gives wearers an Instagram-worthy look in an instant without making any drastic changes to your natural hair. An adjustable wig, this hair accessory features interior elastic straps making it comfortable to wear for hours on end. The long synthetic locks are gathered into loose curls that fall around the shoulders. The pitch black roots transition into a beautiful gray color, recreating the popular ombre style that all the style influencers are rocking right now. You can wear this wig every day or pair it with a costume for a more authentic look this Halloween. We recommend using this wig to accent an evil queen costume, a spellbinding witch costume, or a gorgeous ghoul costume.